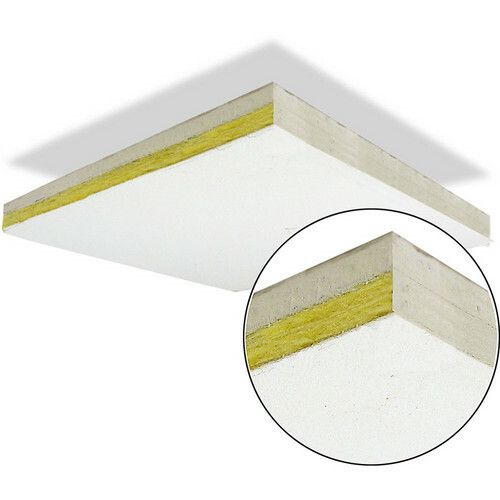 Primacoustics ThunderTile Acoustic Ceiling Tile delivers exceptional sound absorption for recording applications, as well as offices, commercial retail stores, or anywhere wall treatment can't be applied. The tiles feature a 1/2" (12mm) gypsum board backing for added absorption properties. In addition, the tile is constructed from 6 lb per cubic foot rigid fiber glass, and encapsulated with a micro-mesh and fiber-glass facing. Each tile installs into ceiling tile frames that acommodate 2 x 4' (60.96 x 121.92cm) tiles. These tiles feature a "trim" edge that mounts the tile flat against the ceiling tile frame. Box Dimensions (LxWxH) 50.0 x 27.0 x 6.0"